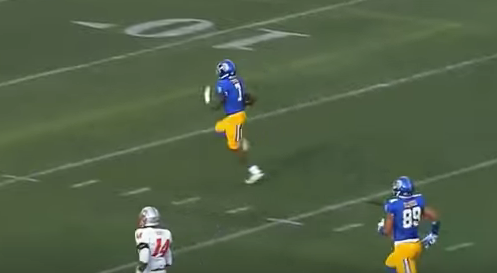 BYU at San Jose State – 8:30pm CBSSN: SJSU running back Tyler Ervin is a stud. He has almost 1200 yards rushing already this season and 12 TD’s. BYU are some tough dudes though. Last thing they want is for this guy to run wild on ’em. Penn State at Northwestern – 9am ESPNU: Big Ten match up with poll position for a decent bowl game on the line. Duke at North Carolina – 9am ESPN2: UNC is getting no love this year and Duke is coming off of that bad referring loss to Miami. Is there a hangover for Duke? Notre Dame at Pittsburgh – 9am ABC: All Pitt is doing is winning. Yes they are coming off of a tough loss to UNC but they are hard nosed football team. Notre Dame is going to get all it wants from the Panthers. Florida State at Clemson – 12:30pm ABC: Clemson is the number 1 team in the land. Florida State doesn’t care. TCU at Oklahoma State – 12:30pm FOX: TCU is getting no love…even with the number 2 offense in the country. The over/under is 78. We vote to take the over. Cincinnati at Houston – 1:30m ESPN2: These two teams rank 5th and 7th in total offense at the FBS level. That alone is a reason to watch. Navy at Memphis – 4pm ESPN2: Navy is 6-1 with the NCAA All Time touchdown king in quarterback Keenan Reynolds. Memphis is shooting for a big time bowl bid. Should be whoever has the ball last wins. Boston Bruins at Montreal Canadiens – 4pm NHLN: Original 6 matchup. LSU at Alabama – 5pm CBS: Two teams that are currently in the College Football Playoff. Arsenal vs Tottenham – 7:55am NBCSN: A North London Derby for your Sunday morning. Oakland Raiders at Pittsburgh Steelers – 10am CBS: Man, can’t believe the Raiders are a must watch team. This could be the best game of the day. Green Bay Packers at Carolina Panthers – 10am FOX: Packers got exposed last week in Denver. Now they have to rebound on the road against another undefeated team. DC United vs NY Red Bulls – Noon ESPN: Red Bulls got the always valuable road goal so they look to be in good shape in this one. Seattle Sounders vs FC Dallas – 4:30pm FS1: First game was a 1-1 draw which gives Dallas the advantage heading into the second leg. Portland Timbers vs Vancouver Whitecaps – 7pm FS1: Like the Seattle vs FC Dallas game, the first game was a draw and that should give the Whitecaps the advantage here.